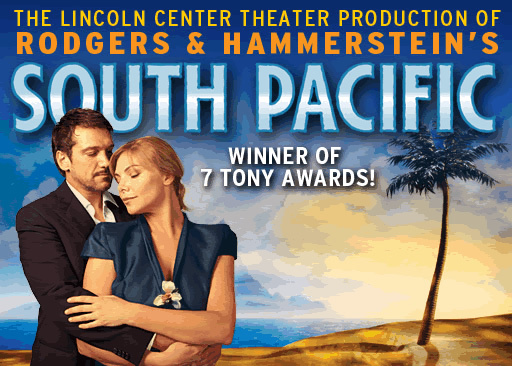 It will be interesting to see how many, if any, of the print critics make reference to one of the most significant aspects of the Barbican’s import of the Lincoln Center production of South Pacific: the ticket prices. The majority of the stalls is priced at £85, making the slightly restricted view seats a whopping £65 and you have to go up to the upper circle before prices start to drop. Not willing to spend so much, we went for the second-cheapest option, up in the balcony / gallery – £20 seats which were reduced to £16 with my membership – rather disgracefully the membership discount only being applicable to the first four performances, thus this is a preview being reviewed here. But credit where it’s due, the seats were just like the normal ones, comfortable with lots of leg room and you really are not that far away from the stage at all: it is so nice to find a venue with cheap seats that don’t take the p*ss out of the audience member and their comfort. But to the show. This was an extremely well-received production in New York, winning a handful of Tonys and running for 2 years, and so Bartlett Sher has sought to recreate its success for this engagement at the Barbican ahead of a UK tour, even bringing over three members of the original cast. There’s apparently 40 people in the cast (though I counted a few less) and an orchestra of 25 so words like lavish and breathtaking are being thrown around, presumably to mitigate for the pricing, though it is not evident that much investment has gone into the set design… It is one of Rodgers and Hammerstein’s most well known musicals, last seen in London ten years ago at the National Theatre but that was before my time here. Set during World War II on a naval base where US sailors are waiting to be deployed in the Pacific War, American nurse Nellie Forbush falls for expat French plantation owner Emile de Becque but their happiness together is threatened by revelations in his past and her inability to deal with them, but also the arrival of actual combat. And of course there’s the score, stuffed full of bona fide classic songs like ‘Bali Ha’i’, ‘I’m Gonna Wash That Man Right Out Of My Hair’, ‘There’s Nothing Like A Dame’, ‘I’m In Love With A Wonderful Guy’ and ‘Some Enchanted Evening’, it has a lot going for it. But I have to say, and caveats about previews repeated here, little of that was in evidence when I saw it. The production felt rather lacklustre throughout, lacking in energy across the board, but crucially missing the key ingredient of chemistry between its leads. Brazilian baritone Paulo Szot plays Emile with a richly gorgeous tone of singing voice but one which feels more akin to a concert – people were ‘bravo’-ing his songs one by one – as it doesn’t glide seamlessly into place with the production as a whole, matters further exacerbated by a concurrent lack of focus on actual acting. There’s a strong element of personal taste to this, I don’t like Alfie Boe for much the same reason, but good musical theatre to me is more than just a strong singing voice. On top of that, Samantha Womack as Nellie feels like a very strange piece of casting: her willingness to abandon the relative safety of a role in Eastenders to stretch her artistic wings is to be admired but I suspect this is a step too far. They end up making a strange couple, she has more of the acting chops than Szot but substantially less of the voice. Worse of all they are singularly lacking in any kind of chemistry together which robs the show of any kind of genuine emotion and without buying into their romance, what is left is not a pretty picture. Without the empathy for Nellie, the sympathy for her character that comes in the second half as a result of her racism feels so wrong; without feeling for Emile, there’s no sense of the tragedy of his decision – altogether, these emerge as difficult characters to care about but more importantly, not enough is done to make us care about their story. Sher’s direction is very much on the ruminative and restrained side of things, one could even label it as an attempt at realism, and this is a distinct attempt to mark this as something other than a ‘Broadway musical’ per se. Its stance on inter-racial marriage sets it out as an interesting piece of social commentary especially considering when it was written but as it stands, I just don’t think this approach works. This approach simply saps the life out of the production: ‘There’s Nothing Like A Dame’ feels rather flat, choreography being eschewed for a kind of co-ordinated movement here, but the straining for ‘realism’ is ridiculous in a song like this and so it doesn’t have the vitality it deserves. Likewise with the women’s number ‘I’m Gonna Wash That Man…’, there’s hints of what fun could be had with the number but all of them dulled with the lack of follow-through. Michael Yeargan’s set design underwhelmed, a cheap-looking beach stretching along the back of the stage, a naff-looking revolving platform for the talent-show stage and a set of panels dropping in to take us from military offices to French Colonial houses: only the airplane which appeared for a number really impressed. I can’t say I was much impressed by the supporting cast either: Alex Ferns made little impact as the cheeky Billis; Daniel Koek struggled to give his Lt Cable any discernible personality that might help us care about his plight and Elizabeth Chong is hamstrung by having nothing to work with as his love interest Liat. The saving grace of the production is the pleasure of hearing a large orchestra play the score so brightly under Ted Sperling’s musical direction. And original cast member Loretta Ables Sayre has fun with Bloody Mary, bringing a mystic air to her songs and the one character whose emotional outburst I was actually convinced by. But there’s simply too much that doesn’t work here to make this anything less than a crushing disappointment: more than anything, I just found this tediously dull (though it should be said this was far from the prevailing attitude in an otherwise largely appreciative audience). Absolutely agree with everything you said, particularly the comment 'a concurrent lack of focus on actual acting'. I was so disappointed by it, especially after all the praise the New York production received. I can only conclude that it was far better in New York – here it felt flat, lifeless, emotionless and dull. Unfortunately, I had paid £65! Well that makes 3 of you that didn't like it and you've been tweeting each other about it saying the same thing and now two of you have posted reviews of a preview- why review a preview?? The other guy who posted a review of a preview also tweeted a complaint about the ticket prices just before he saw it, nothing like an open mind. Don't you think you may have been a little too influenced by the ticket prices? At least you acknowleged the rest of the audience really liked it, tweets have been overwhelmingly positive. And the part of Emile was written for an opera singer, there's nothing unusual about an opera singer in that role. If having a opera singer in a production really bothers you, you were never going to like this. And what the heck has your dislike of Alfie Boe got to do with it (isn't he out of opera anyway?) And the line is "you can't light a fire when the wood's all wet." Nellie's not singing about starting a forest fire! There is no mention of the word preview anywhere on the website for the show or the theatre or on any of the promotional material. In fact, 'anonymous', when I asked what the preview discounts at the box office were, I was specifically told that there were no previews for this show. So there's no reason why anyone shouldn't write about what they have seen, especially when they have paid for their own ticket. Your arguments are rather pathetic considering you simply object to someone not liking this show, I'm not hearing you defend any aspect of this production…is that because you haven't actually seen it??!! We saw it yesterday afternoon and left at the interval: woefully, woefully miscast and devoid of any of the emotion that the show needs to tell its story. Andy, are you the reviewer here or what? I had to hunt around through the Barbican's various press releases to even find out when the press night was, and there were no discounts for previews, so the "don't review previews" argument is invalid here. I was sitting next to the reviewer at this performance, and I agree entirely – a dull, lifeless production. A big disappointment, I was really looking forward to it. Thank you for your comments all. Anonymous #1 – I do think there's a certain level of expectation that came with it from the US and I wonder if there was a slight assumption that it would be easy to recapture the same magic – not everything transfers quite so easily across the Atlantic. Anonymous #2 – thank you for the correction on the lyric, I’ve amended it now. Please treat other commenters with respect though, opinions are great things in that we can all have our own. As for your other points, here goes. – This blog is effectively my personal theatre diary: I review everything I see, when I see it. I had the opportunity to save money buying tickets when I did so I took it, that’s why this performance was reviewed. At the risk of starting up an old, and unending, debate, I do believe strongly though, that if £85 is being charged for a show, it is questionable whether the concept of ‘previews’ are really applicable: to my mind, it is close to insulting an audience to charge that much for something that isn’t considered ready. Also, would you have questioned my review had been it been more positive? I think the issue is more that I didn't love the show as much I suspect you do. – I believe that I did approach the show with an open mind: my issues with the pricing were dealt with a long time ago when they were first announced and in the end, as I say, I was pleasantly surprised by the quality of my seat so was in a much better frame of mind sitting down before it started than can have been reasonably expected! – Having never seen the show professionally before, so I didn’t have any preconceived notions about it all. I wasn’t aware it was a part written for an opera singer, nor was I aware that Szot was an opera singer rather than an actor: my point still stands though, this is a show not a concert, I expect acting as well as singing. The reason I mentioned Alfie Boe was because I had seen Les Miserables this week too and had a similar reaction – the focus being on his singing rather than the acting. Clearly lots of people are fine with this and that is fine, but this is about what I thought of it, and it just isn’t my thing at all. I would be very interested to hear what you thought of the show though, you are clearly a fan, and I do like to hear contrasting opinions to see what it is that others liked and that passed me by. We haven't seen the show, but we were certainly shocked at the ticket prices, and the claims that this is a Tony Award winning production when barely any of the original cast are in it. Here's our take on it. To be honest we are amazed so few others have picked up on the outrageous pricing. As for opera singers, don't forget that Philip Quast, a highly respected musical theatre star, won a 'Best Actor in a Musical' Laurence Olivier Award for his portrayal of Emile de Becque – we're with Ian on this one. I've seen the show twice – one preview and again on first night. I loved it. Standing ovation both nights. Nuff said. I am going to see this for my birthday; am now wondering if it's not perhaps the best option?! Thanks for the warning, although I have heard reports of a triumph elsewhere. According to the Barbican Box office staff there were no previews for South Pacific. The show had a press night a week into the run but all performances are classed as a full performance and not a preview.